Contrary to popular belief, it doesn’t have to cost an arm and a leg to have a little fun in the City by the Bay. And although most folks know about the popular free attractions — such as Fisherman’s Wharf — many of the city’s lesser known freebies are completely overlooked. With that in mind, here are some San Francisco sights you can enjoy without forking over a single penny. Not only are they all wheelchair accessible, but they are all also located near accessible public transportation. So hop on BART (www.bart.gov) or the Historic F-Line Streetcar (www.streetcar.org) and enjoy San Francisco on a shoestring. 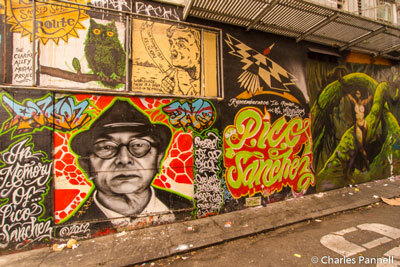 For a good taste of the ethnic side of San Francisco, take BART to the 16th and Mission Station, to check out the Clarion Alley Murals. From the BART station walk south on Mission, past 17th Street and turn right on Clarion Alley. It’s a short level walk, and there are wide sidewalks with curb-cuts along the route. Take some time to examine the details of the colorful murals along the alley. Some are large and some are small, but they all have some sort of a message. This community project began back in 1982, as an outlet for local artists. Today it’s part of the larger collection of the Mission District’s public art. Take BART to the Civic Center Stop, for your next freebie. Walk up Hyde Street to Fulton and take a left. San Francisco City Hall will be in front of you, and the library will be on your left. San Francisco City Guides (www.sfcityguides.org) offers free tours of this National Historic District and San Francisco City Hall on Tuesdays and Thursdays at 11 A.M. The hour-long tour begins on the main steps of the library, on Fulton Street. Even if you don’t take a City Guides tour, San Francisco City Hall (www.sfgov.org/cityhall) is still worth a visit. This version was built in 1915 after the former incarnation was completely destroyed in the 1906 earthquake. The rotunda – which is the fifth largest dome in the world – is magnificent. There’s elevator access to all levels, lift access at the front entrance, and level access at the Van Ness entrance. Free docent-led tours are conducted on weekdays at 10 A.M., 12 P.M. and 2 P.M. 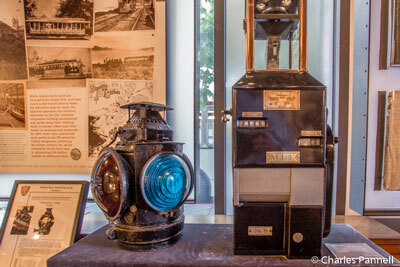 These hour-long tours begin at the City Hall Docent Tour Kiosk, on the main floor near the front entrance. For a peek at vintage San Francisco, head west on Market Street from the Embarcadero BART Station, then turn right on Steuart Street and walk about a block to the San Francisco Railway Museum www.streetcar.org/museum. There’s no charge for admission to this small museum which contains old photos, memorabilia and articles about San Francisco’s historic streetcars (not to be confused with the cable cars). The volunteers on duty are also very knowledgeable about the current streetcar routes, which operate with historic rolling stock. The F-Line Streetcar departs about every 10 minutes from the museum, and there are accessible boarding platforms along the route, so wheelchair-users can also enjoy it. Granted it’s not free, but at just $2.25 it’s a very affordable way to get to your next stop – Pier 39. 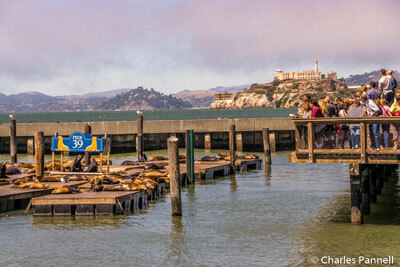 No visit to San Francisco would be complete without a stop at Pier 39 (www.pier39.com) to see the famous sea lions. They began arriving in droves shortly after the 1989 Loma Prieta earthquake, and have been a fixture ever since. At first there were only about 50 of them, but thanks to a good food supply, the population increases to 900 or more in the winter. During the summer months most of them migrate to the Channel Islands for the breeding season, leaving a small group behind. They’re entertaining to watch, perched on the floating docks, barking at one-another and frolicking in the water. Access is good in the viewing area too, with level access out to the end of the cement pier. Last but not least, save some time to visit the San Francisco Maritime National Historical Park (www.nps.gov/safr/), located near Fisherman’s Wharf, at the foot of Hyde Street. 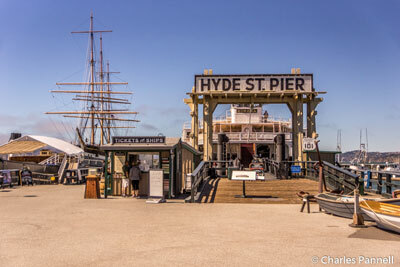 Also known as the Hyde Street Pier, it boasts a large collection of historic ships, as well as some maritime exhibits. There’s level access out to the pier, which makes for a very pleasant stroll. There’s no charge to walk along the pier, but if you want go aboard the ships there is a $10 charge (some of the ships are accessible). A free cell phone tour that details the history of various ships is also available. As an added bonus, it’s a great place to get a good view of the majestic Golden Gate Bridge.